Sound energy travels in waves and is measured in frequency and amplitude. Amplitude measures how forceful the wave is. 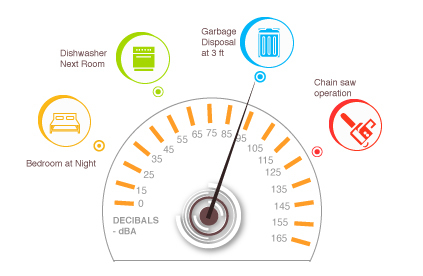 It is measured on a Logarithmic scale and reported in decibels or dBA of sound pressure. 0 dBA is the softest level that a person can hear. Normal speaking voices are around 65 dBA. A rock concert can reach about 120 dBA but is often at 100 dB. Sounds that are 82 dBA or above can permanently damage your ears when exposed for a long period of time. The more sound pressure a sound has, the less time it takes to cause damage. For example, a sound at 85 dBA may take as long at 8 hours to cause permanent damage, while a sound at 97 dBA can start damaging hair cells after only 30 minutes of listening. Frequency is measured in the number of sound vibrations in one second. A healthy ear can hear sounds of very low frequency, 20 Hertz (or 20 cycles per second), to a very high frequency of 20,000 Hertz. The lowest A key on the piano is 27 Hertz. The middle C key on a piano creates a 262 Hertz tone. The highest key on the piano is 4186 Hertz. Have you even been in a noisy factory and had to cover your ears? Walked past a jackhammer in the street and winced because the sound was so loud? Being exposed to loud noises for a brief period usually does no harm, but imagine having to suffer it hour upon hour, day after day. Noise that can damage your ears is referred to as “Toxic Noise”. A reliable way to determine if you have Toxic Noise is to stand 1 meter or 1 yard from someone. If they can’t understand you when speaking at a normal conversational level, you have an indicator that you have Toxic Noise. Once you determine you have Toxic Noise, the first thing you need to do is measure how loud it is so you can take effective steps to reduce it. Making precise measurements of noise used to be quite a tricky business, but now there are automated, electronic sound-level meters that do the job for you. How loud a sound seems to depend on who’s listening. A young person playing rock up in their bedroom might not think their music is loud, but their parents in the room down below might have other ideas. In other words, how loud things seem is a subjective thing and not something we can easily measure. However, what makes one sound seem louder than another is the amount of energy that the source of the sound is pumping towards the listener in the form of pressure variations in the air. That’s the intensity of the sound. Meters that measure sound levels work by calculating the pressure of the sound waves traveling through the air from a source of the noise. That’s why you’ll sometimes see them referred to as sound pressure level (SPL) meters. Devices like this give a measurement of sound intensity in units called decibels as we mentioned before. Telephone pioneer Alexander Graham Bell first devised this scale. Below check out the sound odometer and the intensity of various sounds. If you think you have toxic noise, and you want help measuring it, contact (in the U.S. hearus@protectear.com and in Canada contact hear@protectear.com ). Because the scale is Logarithmic the difference between 10 decibels and 11 decibels is 10x the sound power just like the Richter scale for measuring the intensity of earthquakes. A European study showed exposures of up to 82 dB resulted in the same hearing loss as the general non-noise-exposed population. At 85 dB the noise-exposed population experiences twice the regular population’s level of hearing loss.